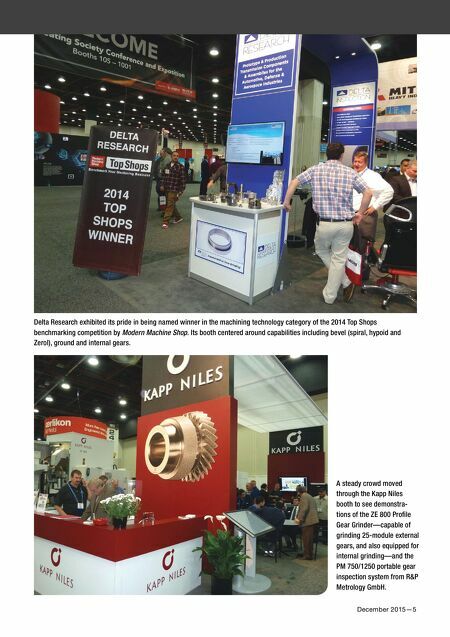 4—GEAR Production Supplement F E A T U R E By Russ Willcutt | Editor Inside Gear Expo Billed as "The Drive Technology Show," this year's event featured new machine designs and cutting tools, heat-treat processes, and materials and hardening processes for hybrid transmission applications. 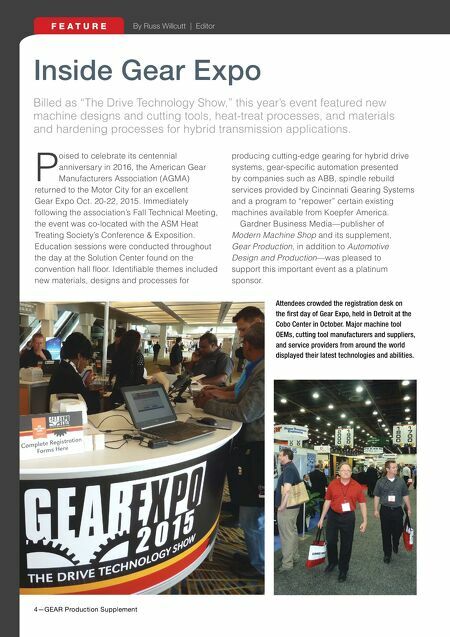 P oised to celebrate its centennial anniversary in 2016, the American Gear Manufacturers Association (AGMA) returned to the Motor City for an excellent Gear Expo Oct. 20-22, 2015. Immediately following the association's Fall Technical Meeting, the event was co-located with the ASM Heat Treating Society's Conference & Exposition. Education sessions were conducted throughout the day at the Solution Center found on the convention hall foor. Identifable themes included new materials, designs and processes for producing cutting-edge gearing for hybrid drive systems, gear-specifc automation presented by companies such as ABB, spindle rebuild services provided by Cincinnati Gearing Systems and a program to "repower" certain existing machines available from Koepfer America. Gardner Business Media—publisher of Modern Machine Shop and its supplement, Gear Production, in addition to Automotive Design and Production—was pleased to support this important event as a platinum sponsor. Attendees crowded the registration desk on the frst day of Gear Expo, held in Detroit at the Cobo Center in October. Major machine tool OEMs, cutting tool manufacturers and suppliers, and service providers from around the world displayed their latest technologies and abilities.